EOSPY Server — Web application (Web app) is a server application that delivers EOSPY – Executive Order Sensor Processor sYstem GPS information over the Internet through a web browser interface. The EOSPY – Executive Order Sensor Processor sYstem Server main control window ties all location and environment monitoring information on one GPS Web Browser Map Screen. EOSPY Server is designed to support as many tracking devices as possible from popular GPS vendors. Check the EOSPY device list for supported GPS tracking devices. With EOSPY Server software setup is a breeze. Just install the EOSPY Server software on your server computer or AWS, enter the new GPS device unique identifier and use any browser to connect to your web server. 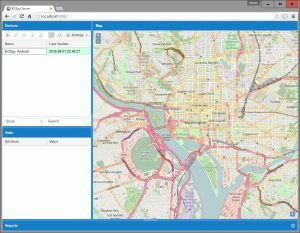 Executive Order Spy Server is a web application for viewing “Real Time” live GPS tracking information over the Internet/Mobile cell network that does not require a monthly service subscription or fee. The EOSpy Server provides information about any GPS tracking device directly in your web browser. This unique product design allows live GPS tracking and surveillance without a costly monthly, third party subscription service. EOSPY – Executive Order Sensor Processor sYstem Server works with many different GPS tracker manufacturers. You can monitor most manufacturers GPS devices or from our EOSPY Android Client App from anywhere in the world. Many companies make GPS trackers designed for advanced tracking or monitoring specifically for vehicle tracking using GSM and GPRS technology. The GPS tracker is designed for use in any vehicle to track their location (boats, aircraft, motor homes, trucks and construction machinery) plus many more live tracking possibilities. Small GPS tracking devices are useful for tracking your fleet vehicles or belongings/merchandise. The Executive Order Spy application also allows for remote monitoring and GPS movement notification from manufacturers that are compatible. You can be notified when there is motion, your front door opens, garage door, back door, gate, or window. You can also be notified by someone pressing a panic button on the remote GPS tracker. Vehicle Location – EOSPY can check your vehicle’s current location, speed and distance from your computer. All of this fleet information in a simple and intuitive GPS live screen with a live map. 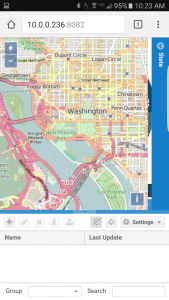 Remote GPS Information – When and where your vehicle traveled since you installed the app. Also, it shows the current address of that location with Latitude and Longitude. EOSPY – Executive Order Sensor Processor sYstem Server also works with many different browsers, including you mobile phone and tablet device browser. EOSPY Server mobile application for viewing “Real Time” live GPS Tracking information over the Internet/Mobile Cell network that does not requiring a monthly service subscription or fee. The EOSPY Server provides information about any GPS GSM Tracking Device directly on your smart phone or tablet. Executive Order EOSPY Server – The GPS Tracking automation and remote monitoring system is a complete package for business or office. Its wireless GPS tracking allows you to monitor your office, systems, personal property, and business from anywhere in the world. Receive remote information from any number of events like when an employee arrives on-site or where a vehicle is located. With EOSPY Server remote live GPS map tracking information you can monitor and manage your home, office or fleet anywhere, anytime using your mobile phone-table web browser. 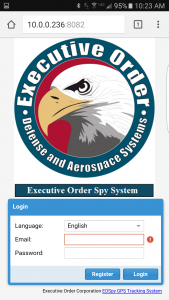 The Executive Order EOSPY Server unique product design allows live GPS tracking and surveillance all on your mobile phone or tablet, without a costly monthly, third party subscription service. 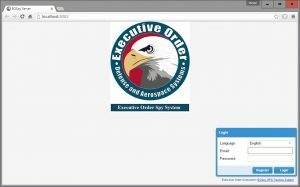 Download Executive Order Spy Server EOSpy Server – best of all, it’s FREE, with no expensive monthly monitoring charges. Start protecting you property, your business and be able to monitor everything at your business or office from your fingertips.